TGIM! 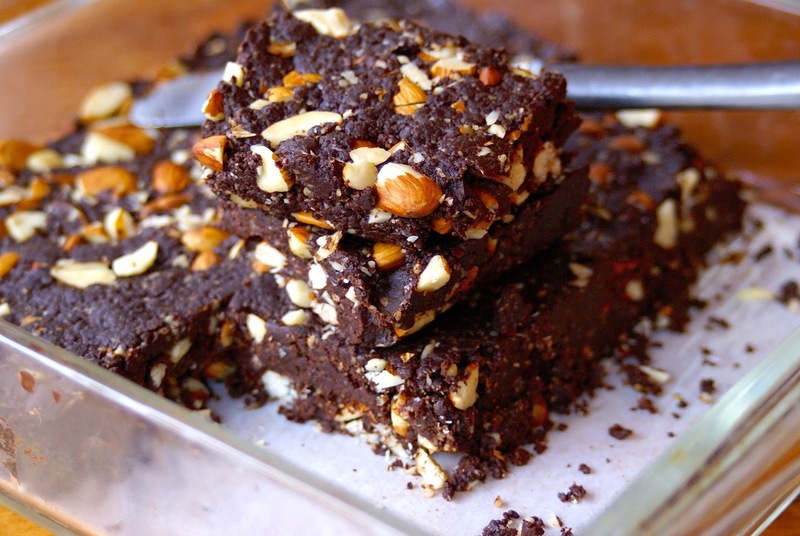 I know Mondays are rough so I wanted to brighten yours with an incredible brownie recipe. The only thing better than brownies, are brownies that from start to finish take less than five minutes to make. 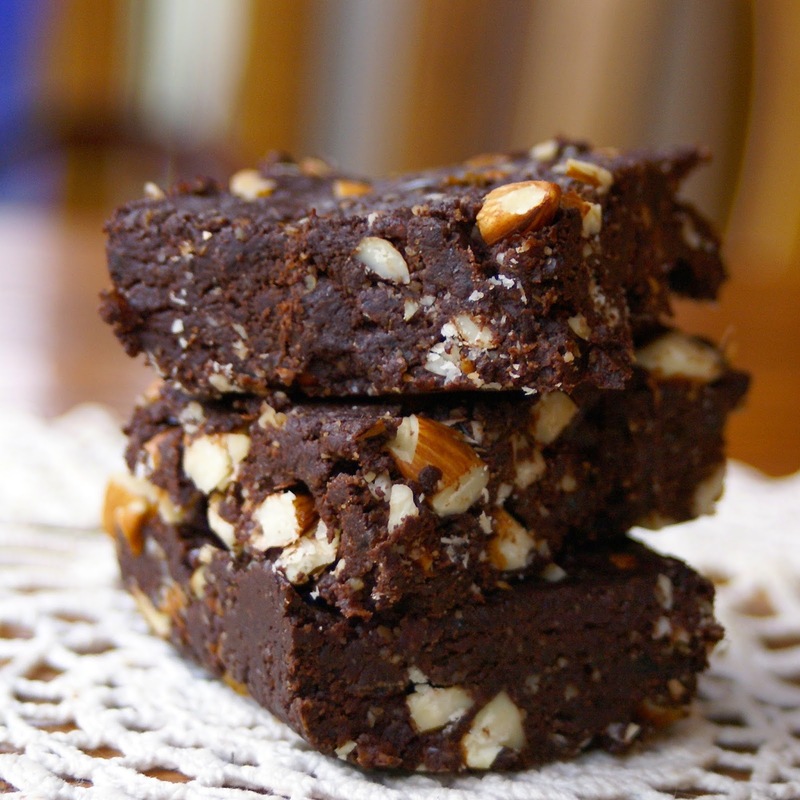 Rich, decedent, irresistible, fudgey brownies that are ready in the blink of an eye. They are sinfully good, even better than baked brownies. 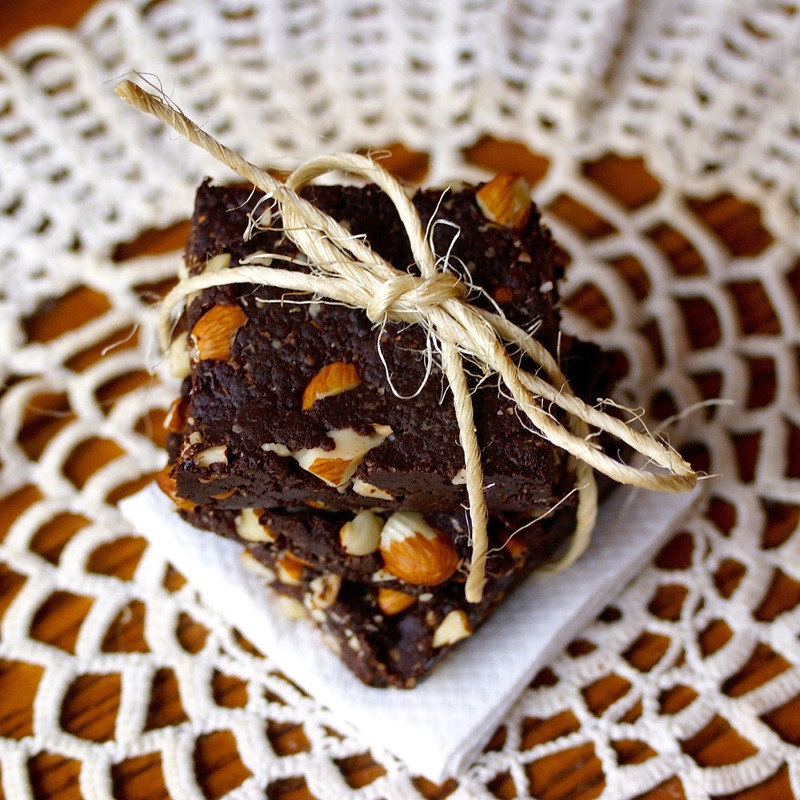 Boasting only three main ingredients, dates, walnuts, and cacao powder, there is no reason to not fall in love with these brownies! These brownies pretty much speak for themselves, so before I let you go run into the kitchen and whip up a batch, I’d like to briefly talk about the three main ingredients to really get you excited about this guilt free treat! These sweet, dried fruits are one of my favorite natural sweeteners. While they are packed with natural sugars, they are a low-glycemic index food that do not significantly raise blood-sugar levels and don’t leave you with a sugar crash. They are also high in fiber, with just one date covering about 6% of your recommended daily fiber intake! If all that is not enough, dates will add vitamins and minerals to your diet. They contain B vitamins as well as vitamin K and A. The minerals in dates include copper, magnesium, calcium, phosphorous, iron, and zinc. Who needs multi-vitamins when you can eat a treat made of dates! Containing a whopping 2.5 grams of omega-3 fatty-acid, 4 grams of protein, and 2 grams of fiber per ounce, walnuts are quite the super nut! Walnuts can help you sleep thanks to meletonin, are great for your hair due to high levels of B7, and can help prevent signs of aging thanks to B vitamins and antioxidants. Like other nuts, walnuts are also great for hunger control, cancer prevention, and stress reliever. 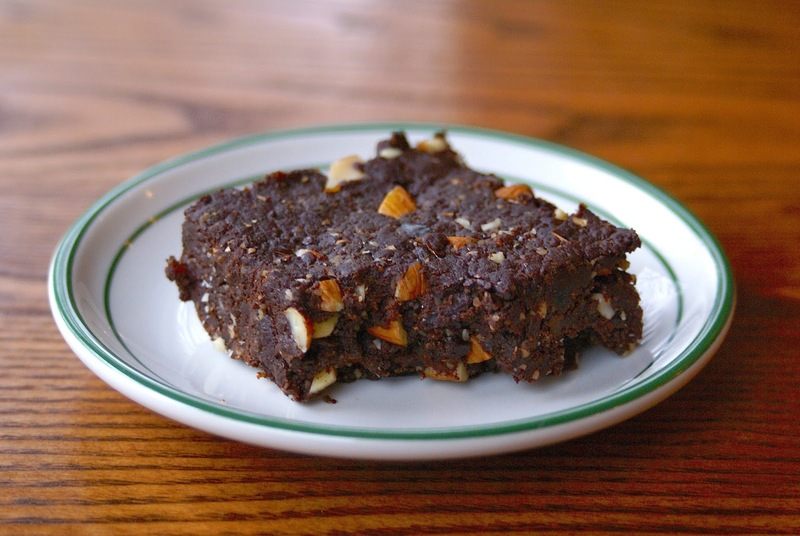 You can bag these brownies for lunches or as a afternoon pick-me-up. I often keep one in my purse when I’m out all day in case a chocolate craving hits! You can also cut them into pieces sprinkle them on ice cream, smoothies, and oatmeal. I love how they are so simple to make and pack such an outstanding chocolaty flavor. Let’s keep in mind Valentine’s day is coming up and nothing says ‘I love you’ more than a big plate of brownies. I hope I was able to brighten your Monday! Line the bottom of an 8×8 pan with parchment paper. Add walnuts to the food processor and let run until the walnuts are almost a rough flour-like consistency (10-15 seconds). Add cacao powder, cinnamon, and vanilla and process another 5 seconds. Slowly add dates and process until mixture is crumbly, but holds together when pressed with fingers. Mix in chopped almonds by hand and press into prepared pan. Let set in the fridge for an hour. Previous Article← Tempeh Salad Sandwich, Hold the Mayo! Wow!! these brownies look divine! hard to believe they are super healthy!! Amazing!! The texture from the pictures reminds me of one of the chocolate-flavored Larabars I've eaten. I really love the texture and taste of the dates and the way they hold everything together so well. I'll definitely have to give this recipe a try, as I absolutely love Larabars, but they get expensive. These sound amazing and I can't wait to make them! One question: how is cacao powder different from the unsweetened cocoa powder I usually use to make brownies? Are the two interchangeable? Yes, the two are interchangeable. Cacao powder is made from the cacao bean in it's raw form while cocoa powder is made from roasted cacao beans. There is no difference in texture or flavor. Raw cacao powder is more nutritious, but I actually use regular cocoa powder most of the time because it is much less expensive! Just made these and they are absolutely delicious! These brownies are amazing. I was skeptical because of the ingredients but wow we can't stop eating them! Thanks for the recipe. My husband says "Finally a use for dates." How can you not like chocolate?!?! Haha as long as peanut butter and kale are in your life, we are good 🙂 I'm so glad you made yourself the peanut butter cookie dough bites! I would have been sad if you had to watch your husband enjoy a raw treat empty handed. I am almost done with a recipe for molasses cookies for you, just a few more tweaks. Hope you had a great weekend! These are the comments I've been getting all day: "So, it's no added sugar or anything? How can you make something so good out of the most random stuff!" (he doesn't cook much) "These brownies are the bomb." "It's like I've been eating junk food all day and they are so good." "Man am I glad you made these." "Who needs ice cream from the store when we have brownies at home?" Clearly these are a hit at my house. You can use hemp seeds to replace the walnuts. I actually make these with hemp seeds sometimes, they are just as yummy! Unsweetened coconut would work as well. Hope this helps! Absolutely delicious. Was craving for a midnight snack and what a great way to help with your chocolate cravings. Just found your site, was looking for low carb snacks but these are healthy and will satisfy my sweet tooth. I have already made a number of dishes this morning as i have the basics in the pantry, just needed more inspiration and have found it. So I just tried your recipe and it's awesome! Tastes amazing, It's setting in the fridge now. (I ate a spoon full of the mixture). I had an idea, next time I will turn it into truffles! I'm going to shape it around a fresh raspberry to make a ball and then dust them in extra cacao. I'll let you know how it goes. That sounds amazing!!! Raspberry + chocolate = the best 🙂 Glad you liked this recipe, it's a keeper for sure. I'm also impressed you only ate one spoonful of the mixture before putting it in the fridge 😛 Looking forward to hearing how making truffles goes!! So glad you enjoyed them! I always have a batch on hand as they are my go-to answer to chocolate cravings (which happen almost every day haha).